Coweeta, logs show neither breakdown nor movement (Webster et al. 1999), and thus are of little importance from the perspective of organic C utilization. Leaf litter can fall directly into the stream from the riparian vegetation or reach the stream by lateral movements from the bank. The relative contributions of lateral and direct inputs are highly variable depending on wind patterns, bank slope, ground cover, and the distance between the stream and the forest. Lateral inputs were estimated to contribute roughly one fourth of the total based on a review of many streams of eastern North America (Webster et al. 1995). This is consistent with the finding that lateral inputs contributed between 22% and 27% of total litter inputs in Coweeta headwater streams (Wallace et al. 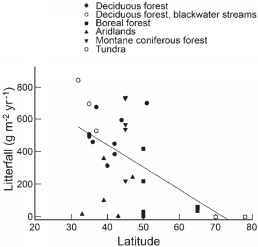 1995), and an estimate of about 30% based on a review of 18 streams from different biomes and continents (Benfield 1997). In the Ogeechee River, lateral inputs were fourfold greater than direct inputs, probably because the width of the river minimized direct litterfall and floodplain inundation maximized inputs from outside the channel. Highest leaf inputs usually occur during the autumn in the temperate zone, although lateral inputs may occur throughout the year. In an Austrian stream, direct CPOM inputs during the autumn contributed 61-65% of total inputs (Artmann et al. 2003). Similar results were obtained for a forest stream in Hokaido, Japan, where leaf litter during October represented 58% of the annual inputs (Kochi et al. 2004). In the deciduous tropics, inputs are greatest during the dry season (Magana and Bretschko 2003). Additional seasonal variation in leaf fall may occur depending on the type of terrestrial vegetation. In Northern Spain, Pozo et al. (1997) noted that leaf litter input peaked during the summer in a eucalyptus plantation but during the autumn in a deciduous forest. In several small New Zealand streams, inputs of leaf litter peaked in the summer in streams running through native forest, but maxima were observed in autumn in pasture areas. In pine forests, litter inputs were lowest in the winter and peaked during the spring when large inputs of pollen heads were observed (Scarsbrook et al. 2001). Logging and other activities that disrupt riparian vegetation can affect the magnitude of leaf litter and wood inputs. Following logging in the catchment of a small stream at Coweeta, leaf inputs fell to <2% of previous levels (Webster and Waide 1982). Allochthonous inputs recovered to near reference values after 5-10 years of regrowth and forest succession, but inputs were still detectably below reference levels after 20 years (Webster et al. 1990a). Although litter inputs from early successional trees were less than those observed prior to logging, these leaves were more rapidly broken down. Pest outbreaks, tree diseases, and acid rain are additional disturbances, often human-mediated, that can reduce leaf litter inputs. Litter inputs expressed per unit area of stream-bed are expected to decline as stream width increases, and be greater in warmer and wetter climates because of higher forest productivity. Bott et al. (1984) reported lower litterfall inputs at fifth-order sites of a Pennsylvania stream compared with lower-order sites, but the expected downstream decline in CPOM inputs has not been apparent in many comparisons, evidently because differences among sites in climate, floodplain connectivity, and anthropogenic influence are of greater importance. In a comparison of litterfall estimates from 33 sites ranging from 780S to 750N and in six different biomes, Benfield (1997) concluded that litter inputs were primarily related to the presence of forested versus non-forested vegetation. Litterfall was positively related to annual precipitation and decreased with increasing latitude, reflecting the influence of climate on overall terrestrial productivity (Figure 12.3). 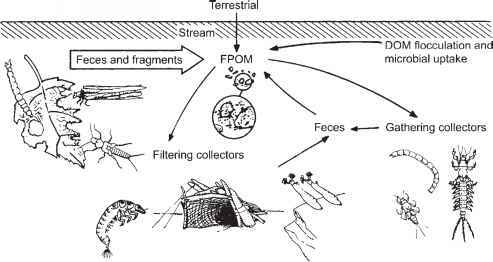 Blackwater streams of the southeastern United States received very high litter inputs as a consequence of floodplain interactions, whereas litter inputs to desert and boreal streams were very low.